On July 17, 2018, Walmart Inc., America's multinational retail company announced its strategic partnership with Microsoft to accelerate its current digital prowess and presence in the global retail industry where its losing grounds fast to Amazon. Earlier, Walmart has expanded its e-commerce ecosystem by acquiring online retailers like Jet.com (2016, United States) and Flipkart (2018, India), by selling its Chinese e-Commerce business Yihaodian to JD.com in exchange for a 5% equity stake valued at US$ 1.5 Billion in the year 2016, and concurrently, adding new features to its mobile app. The retail giant even launched a tech incubator, Store No.8, to develop next-gen shopping experiences in augmented and virtual reality. Under this new strategic partnership, Walmart would be benefitted by making faster check-out via Microsoft's cloud-powered solutions and at the same time making their listed products accessible to millions of their customers around the world. 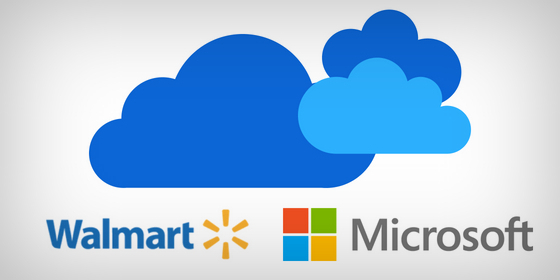 In a five-year agreement, Walmart has selected the full range of Microsoft cloud solutions, including Microsoft Azure and Microsoft 365 for enterprise-wide use to help standardize across the company’s family of brands. "Walmart’s commitment to technology is centered around creating incredibly convenient ways for customers to shop and empowering associates to do their best work," said Doug McMillon, Walmart CEO. "Walmart is a people led, tech-empowered company, and we’re excited about what this technology partnership will bring for our customers and associates. Whether it’s combined with our agile cloud platform or leveraging machine learning and artificial intelligence to work smarter, we believe Microsoft will be a strong partner in driving our ability to innovate even further and faster." "Walmart is a pioneering retailer, committed to empowering its employees and delivering the best experience for its customers wherever they are," said Satya Nadella, CEO of Microsoft. "The world’s leading companies run on our cloud, and I’m thrilled to partner with Walmart to accelerate their digital transformation with Microsoft Azure and Microsoft 365." This partnership will allow Walmart and Microsoft employees/engineers in their upcoming collaboration to the assess, develop and support in moving hundreds of pre-existing modular applications to cloud-native architectures. For example, to grow and enhance the online experience, the company will migrate a significant portion of walmart.com and samsclub.com to Azure, including its cloud-powered check-out enabling Walmart to grow with rising customer demand and reach more global markets than ever before. Innovation: Transforming a customer's shopping experience by enhancing the existing metrics like site availability and speed, or the ability to quickly and seamlessly launch new features will leave with an impression of the progress of Walmart with the customer. Another major area of focus would be energy consumption reduction for a behemoth of Walmart's size by building a global IoT platform on Azure which would have connected Heating, ventilation, and air conditioning (HVAC) and refrigeration units to reduce energy usage in thousands of existing U.S. stores or application of machine learning to route thousands of trucks in the supply chain. Changing Work Processes: Walmart has its emphasis to foster a curious, collaborative, accountable, and agile environment to position the company against Amazon for future growth. Through the partnership with Microsoft, Walmart will be investing in its employees with a phase-wise rollout of complete Microsoft 365 that will provide their employees with the productivity tools. Tools include Microsoft Stream, Microsoft OneDrive & Microsoft Workplace Analytics which will empower accessibility in Walmart associates to collaborate, and remain productive so they can save time and work better.